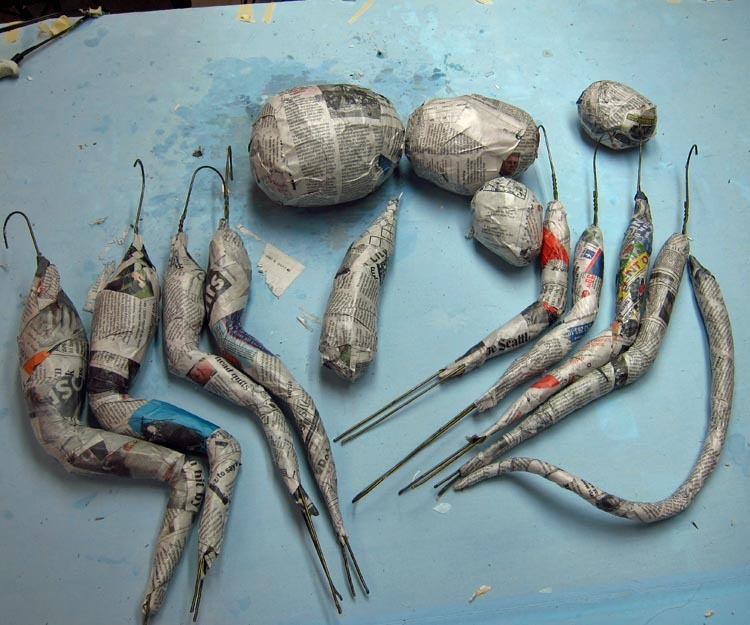 ← New Paper Mache Helpers. Hey all. Well, I’ve started a couple of projects. I’m making one more dragon trophy, just because I bought some lights (pink this time) and need to use them. I am also making a project for an organization based in Los Angeles called, “Kitty Bungalow: Charm School for Wayward Cats.” This is a non-profit group that works with the many feral cats that live in and around that giant city. This will be for an auction they hold once a year to support their efforts. I’ve decided to make a cat-like dragon, or a dragon-like cat. I think it will fit the “feral” theme. In this series of posts I’ll detail the making of the second project, but not the trophy. Most of you have seen enough of those! 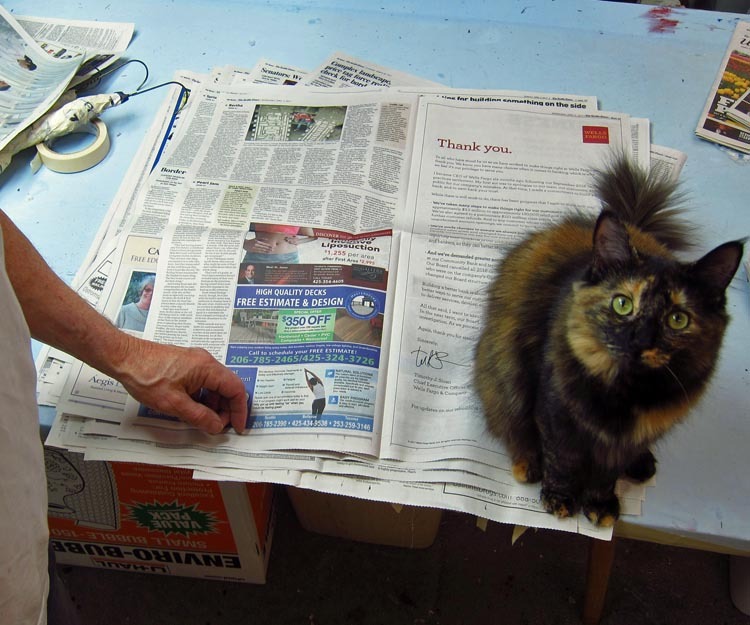 As has been the history with all my “helpers”, Mazzy has decided to help me with the initial crumpling of the paper. (Yes, she is adorable. Hardly a kitten any more!) First I crumpled paper into a “body sized” ball. 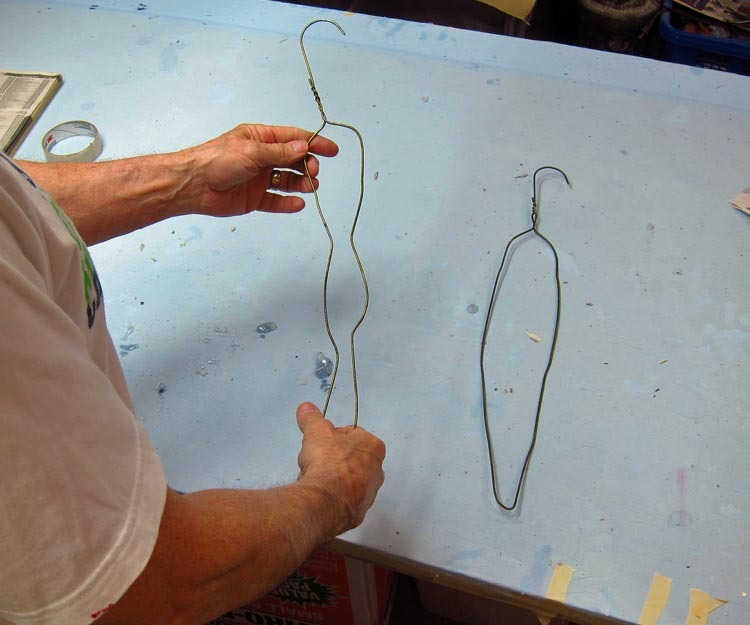 Next, I bent some clothes hangers for appendages. I always make a figure “8” for the arms and legs. Then I stuff them with wads of paper. The top parts of the 8 are for thighs or upper arms. The bottom parts are for calves and forearms. 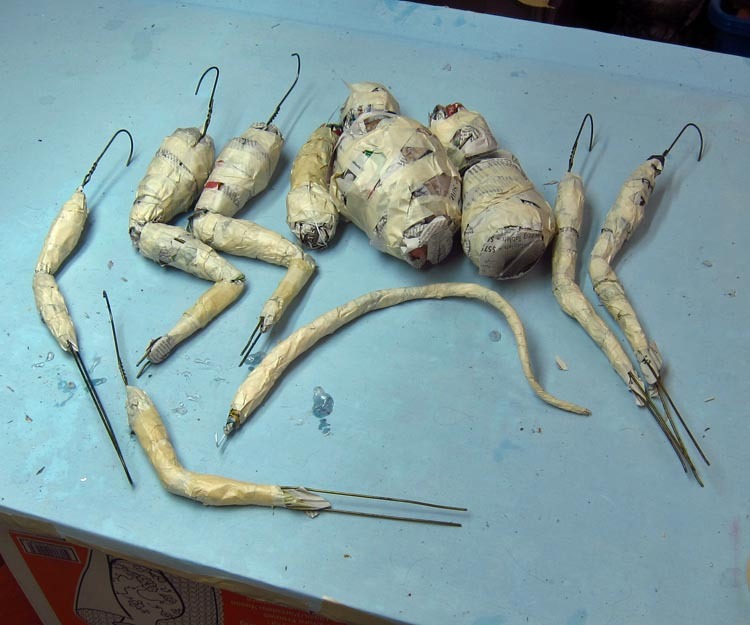 Ready to mache….in the photo below from left to right… I made two small front arms, then two legs, a neck, the main body, a few smaller balls for the head (along with extra balls to use for sculpting), two “arms” for the wings, and a long cat-like tail (in the middle underneath the other pieces). To my surprise, I didn’t have any cheap, white flour in the house! So I used Elmer’s glue for this step instead. I prefer flour and water paste for several reasons. The glue tends to shrink as it dries. And it doesn’t shrink uniformly, so you end up with ridges and depressions that you have to fix later if you want a more symmetric or smooth surface. Also, using the glue makes it much harder to cut the pieces when sculpting, and the pieces are much more brittle if you use glue. So bending the pieces will often times cause them to break. That doesn’t happen with flour and water paste. But the glue will do in a pinch. 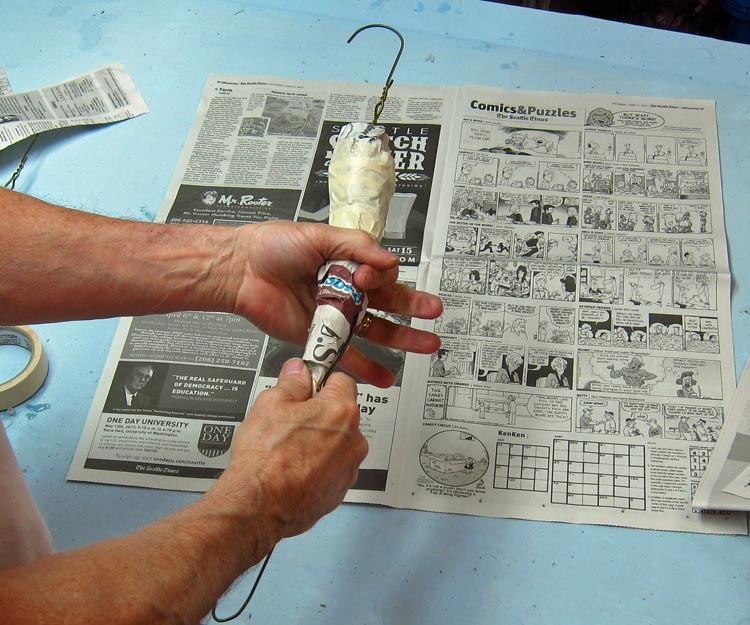 I added the newspaper strips to all the pieces. Here are all the parts after they dried a few days. I’ll be back soon with a new installment. Thank you for your patience. I know I haven’t been very good about posting over the last year. Hope you are all making art! 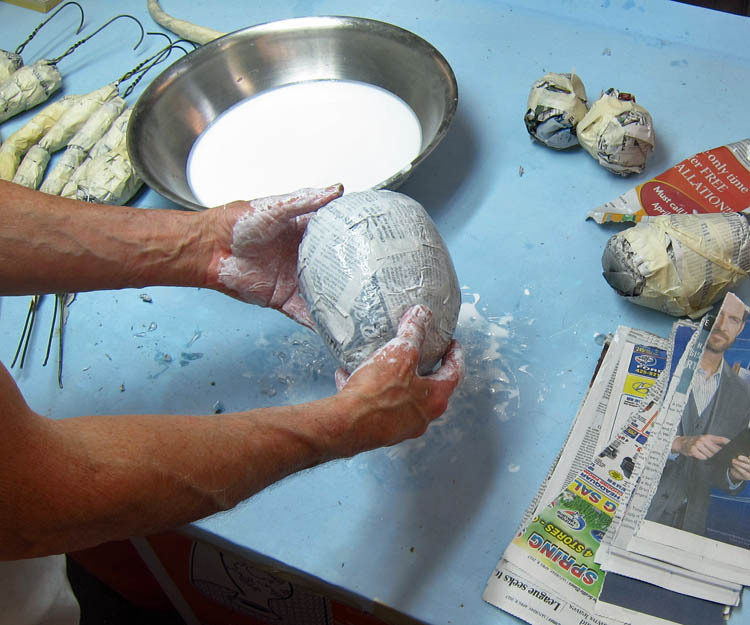 This entry was posted in Paper Mache Dragon-like Cat and tagged arts and crafts, cats, dragons, kittens, mixed media, paper mache, paper mache instructions, papier mache, papier mache recipes, sculpture. Bookmark the permalink. Thanks Deborah. I can’t wait to see it too! Thanks Sherrie. It’s always a bit nerve wracking when I start posting before I have a definite idea about where the project is headed. But I have to trust that it will work out. We’ll see. It’s great to see you back. You’re an inspiration to us all and I hope that you are well. I look forward to seeing your ferel dragon. Don’t worry – whenever you post, someone is always watching! 😉 I love seeing your posts. I’ve only ever made bowls a a few cartoon birds, but I’m thinking of having a go at greyhounds soon. A greyhound would be grand! Give it a try! Thanks for the nice note. Oh goody! This sounds like a fun project. Thanks for keeping us updated. And yes, Maisy is adorable. Thanks Leslie. I’ll try to be better about posting. PS. I know that “Maisy” is the correct spelling. But I named the little cat after the singer Mazzy Star. I love seeing your work, and I’m really excited to se how this one turns out! So nice to see you back. I’m visiting England and was very surprised to see some interesting dragons on a property i visited. That’s when I realized I’d not seen your posts for some time. I wanted to send the pictures to you but I don’t see a place to contact you or attach anything. Hi Anne. 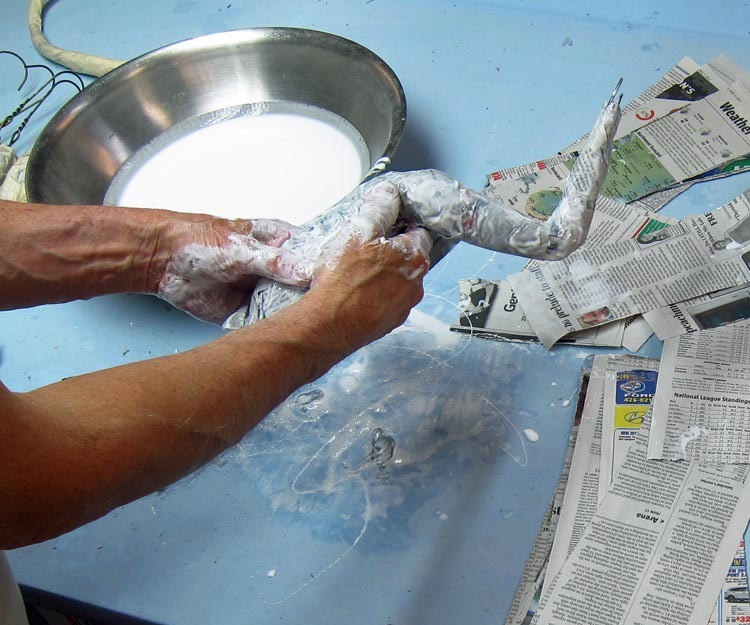 You can always send stuff to me at dan@gourmetpapermache.com. Hope you are having fun on your trip! You are a saint Sherry for working in a shelter. I couldn’t do it. I would want to take them all home. And yes, I think the dragon/cat theme would work well for the feral group of cats. Thanks Vicki! Glad you find this interesting. I hope it will be worth the wait. Yay finally you are back-just know all of your fans have missed you. And of course your helper is absolutely cute! Thanks Heidi! I appreciate your patience. I’ll let Mazzy know that people like her. I’ll show the trophy. Maybe just not the entire process like I will with this cat-like thing. Thanks Lynn! Yay! You’re back. Awesome to see you. Mazzy looks like she’s gotten right into the swing of being a helper. How do people ever make art without helpers? Love your projects, love watching you work. So stoked! Hey Willow. Always nice to hear from you! Hope you are getting through all of your projects! Thanks Angie! Sorry I haven’t been good about posting for a while. But I’ll get better, I promise. Mazzy’s a great-looking cat! My family had a cat that looked almost exactly like Mazzy when I was a lad, named Caterpillar. Also, a great cat! 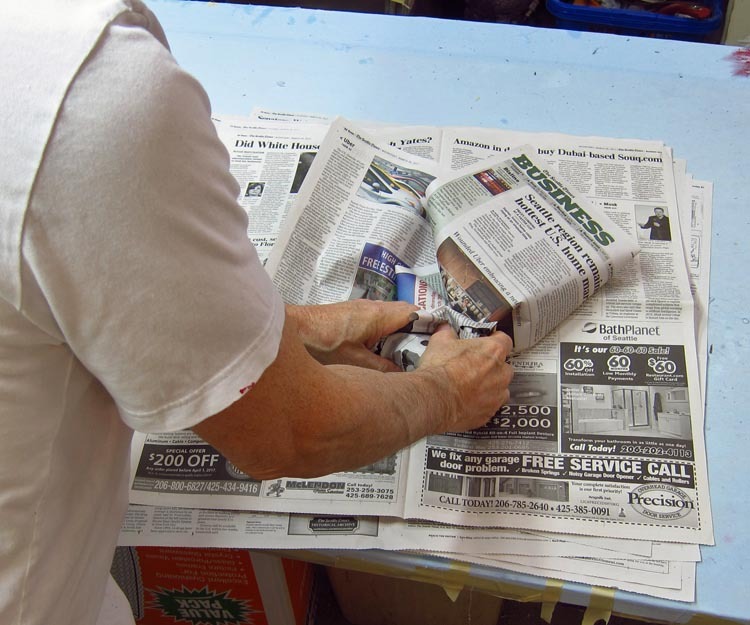 It’s so good to see you putting glue to paper again! Missed your art! Thanks Mike. I’ve always been making art. I just haven’t been posting on my blog. That’s a problem when I do commissions. I tend to get focused on time and don’t put the energy into shooting photos or video. Yes, Mazzy is a great little cat. Very talkative. Lot’s of fun. Hey Catie. I use Clear Casting Resin for the drool on my dragons. It’s basically liquid plastic. I get mine at TAP plastics. Don’t know if it’s a nation-wide chain. Good luck! Hello from England, thankyou for inspiration to give it a go and use my own imagination to create my very own dragon . I’ve watched your utube films and got your book and I’m getting things together to make my dragon .eyes are on order, shields are stained and neck and jaw are ready for paper mache, after work tomorrow. I admire your creative ideas of dragons ,you are very talented. I hope to send you a picture . Great Taz! Glad you are having fun! I think you are going to be very happy with what you make. Good luck! Bonjour Sam. Je suis très content que vous aimiez mon travail. Merci d’avoir regardé les progrès. Bonjour Sam. Content que vous aimiez ce projet! Hi! What do you use for that cloth in glue? Thanks!! Those are old bed sheets dipped in white, all purpose glue. I like Elmer’s.